Will a large-scale war break out in the South Caucasus? The town of Askeran, near the area where clashes with Azeri forces were taking place, in Nagorno-Karabakh region. 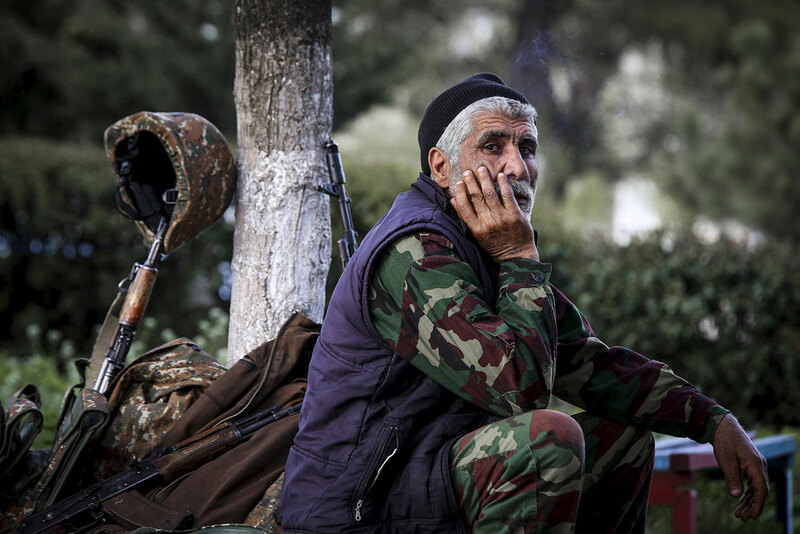 Full-scale hostilities have resumed in the unrecognized republic of Nagorno-Karabakh for the first time since 1994. Armenia and Azerbaijan, who have been in conflict over this region since the 1990s, are accusing each other of "provocations." The Russian press has been actively discussing whether this could signal the start of a new war. In the early hours of April 2, 2016 the defense ministry of the unrecognized republic of Nagorno-Karabakh, which is de facto supported by Armenia, reported that its army was defending itself against an offensive from Azeri forces. For its part, the Ministry of Defense of Azerbaijan reported artillery shelling coming from the Armenian side, whereas the Armenian Ministry of Defense said that it had downed two Mil helicopters operated by the Air Force of Azerbaijan. Later the press service of the Nagorno-Karabakh defense ministry said it had destroyed two Azeri tanks and two drones. Overall, at least 33 people were killed and over 200 wounded according to a report released on April 3 by the UN Office for Humanitarian Affairs. There are fears that the situation could signal a return to the "hot war" of 1992-1994, the Vzglyad newspaper warns. Vladimir Stupishin, former ambassador of the Russian Federation to Armenia, points out that this recent flare-up in tensions may have been provoked by policies being pursued by Turkey, whom Azerbaijan views as its closest ally. In November 2015 Turkish Prime Minister Ahmet Davutoğlu said that Ankara would do everything in its power to free Azerbaijan's occupied territories. The rise in tensions may grow into a protracted conflict between Armenia and Azerbaijan, says Valery Manilov, a former deputy chief of the General Staff of the Armed Forces of the Russian Federation. He warns that, "unless there is goodwill from the conflicting sides, the conflict may increase in scale and shake the whole region." "An imitation of war is not a war after all"
Maxim Yusin, a commentator with the Kommersant business daily, is convinced that neither side is ready to engage in a large-scale war at the moment. Politicians in Azerbaijan are keen to avoid a serious clash. Armenia is an ally of Russia, thus in the event of an offensive there is a risk that Moscow could also become involved. Yet, public opinion in Azerbaijan is unwavering in favor of an escalation at the moment. "The authorities have to take it into consideration,” Yusin points out. “And from time to time they imitate activity at the front lines so that the general public do not get the feeling that the president has resigned to a defeat." In other words, there are no reasons to expect a stabilization in the conflict zone in the foreseeable future. There will be an imitation of war now and into the future. But in a sense this is good news: an imitation of war is not a war after all. "By all appearances, the West was informed of an impending armed provocation on the part of Azerbaijan," Stanislav Tarasov an editor at the Regnum news agency, told the Svobodnaya Pressa online publication. Recently, Turkey has been pushing Azerbaijan to take increasingly aggressive actions. A case in point is the statement Azeri President Ilham Aliyev made during the nuclear security summit in Washington. "We are grateful to the U.S. government for its efforts in finding solutions to the long-standing conflict between Azerbaijan and Armenia. We believe that this conflict should be resolved on the basis of a UN Security Council resolution which envisages an immediate withdrawal of Armenian troops from our territory," Aliyev said after his meeting with U.S. Secretary of State John Kerry. The conflict between Azerbaijan and Armenia began in 1988, when the Nagorno-Karabakh autonomous region (predominantly populated by Armenians) declared its intention to secede from the Soviet Socialist Republic of Azerbaijan. Following the 1992u20131994 war, Baku lost control over Karabakh and seven neighboring districts. Nagorno-Karabakh declared its independence and is de facto an Armenian protectorate. After a ceasefire was agreed to, the talks on Karabakh have been held on the basis of the so-called Madrid Principles proposed in December 2007 by the co-chairs of the OSCE Minsk Group: Russia, the U.S. and France. Azerbaijan officially considers Nagorno-Karabakh a part of its territory.